It's your mandatory first step to riding with us. You'll register your details with the school before your lesson starts, and then be introduced to your horse, and instructor. If you're a beginner, the instructor will teach you the fundamentals of safe Horse Riding, and you'll continue your learning with further Private Lessons. If you can ride, we'll put you through basic exercises to ascertain you meet the standard you specified on the Rider Registration form you filled out before you arrive. We'll then verify and countersign this on your form after the lesson. We require that all new clients participate in a mandator Introduction Lesson (or Assessment Lesson). This is done for your safety, and that of our horses. The session is 30 minutes in duration, and you'll be alone with an experienced instructor in our 40x20m Floodlit Indoor Arena. All Riders must have completed a RIDER REGISTRATION FORM if they wish to Ride at the Chestnuts. This is a questionnaire (mostly multiple choice) which asks the following questions: Personal Info (name, address, age etc) Height and Weight Occupation Medical Condition Emergency Contact Info (inc Doctors Name and Telephone Number) Self Stated Riding Ability (done by tick box). 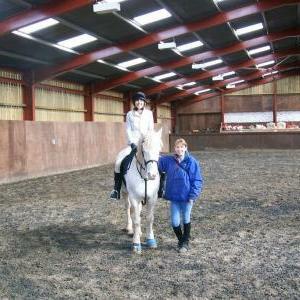 For Total Beginners: it's a safe Introductory Lesson to the fantastic world of horse riding. You should arrive 20 minutes before the lesson to leave ample time for traffic, fill out your Rider Registration form, for us to fit you a hat of the correct size (BS or PAS15+) and riding boots if required. You'll then be introduced to your horse (which will have been picked based on the information you provided during booking: Height and Weight and Previous Experience), and you'll begin learning the fundamentals of safe horse riding. As you've never riden before, you'll be placed on the lunge (the horse is tethered to the instructor), so you can gain your balance, and go through exercises without having to worry about control. But don't worry, all our horses are well schooled (trained) and the safest around. For Riders: as you can already ride, and probably own your own Hat, Stick, Jodphurs and Boots, you can arrive a little closer to the start time, but you still have to fill out a Rider Registration and hand it to your Instructor before you're allowed inside the Arena. (if you need to borrow equipment, that's fine too). You'll be introduced to your horse, and depending what boxes you ticked (and countersigned) on your Rider Registration form, we'll put you through exercises to confirm your level. If you wish to go Hacking, we require all riders to be able to Walk, Trot and Canter proficiently. What do we mean by proficiently? You should be able to demonstrate a safe riding style at Walk, Trot and Canter. You should be able to canter without holding onto the sadle while doing exercises. The instructors decision is final, if they feel you are unsafe, they will not allow you to take part in exercises which put yourself, the horse and others at risk. They will usually offer you alternatives such as further Private Lessons. Because we want you to be safe. Safe riding, is enjoyable riding, and that is our goal. By making all clients take an Assessment lesson, we can stop inexperienced customers from getting into trouble, before they even mount a horse. Once we've determined your riding level, we'll allow you to join other activities such as Hacking, Jumping and advanced Group Lessons.